The countdown is on for the much anticipated decider to the GCL of Mexico City and as we wait to welcome back the 19 teams bidding for glory, which sqauds have been busy making substitutes and which pairs will be returning to battle it out once again in this afternoon’s final? Overnight leaders Paris Panthers hold pole position and Gregory Wathelet keeps the ride on his clear round machine Corree while team-mate Darragh Kenny has opted to switch from Cassini Z to the 11-year-old gelding Team De Coquerie. Showing immense strength in depth within their roster, third placed Valkenswaard United have swapped in Alberto Zorzi on Fair Light van T Heike for Bertram Allen, with Marcus Ehning returning on his home-bred Funky Fred. United look dangerous as one of several serious challengers to overhaul the leaders. Among the chasing pack, Hamburg Giants riders Rene Lopez and Christian Rhomberg have each made horse substitutions as has Eric Lamaze from the Montreal Diamonds, replacing Chacco Kid with Fine Lady. 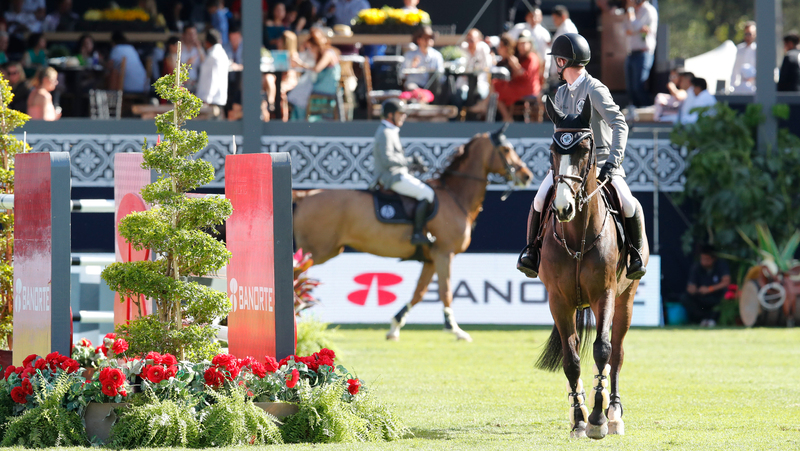 Will fresh horses and riders give the teams an advantage? Or will the experienced players have the upper hand? And who will succumb to the pressure? It’s all to play for in this afternoon’s GCL Team Competition Final and we can’t wait to find out how the drama will unfold. Tune in at 12:45 local time to watch the action LIVE on GC TV.